Interested to see how this turns out. I do think it should adopt the 3.0L. I also think that going forward Lincoln should do the E-Latch on all of their cars--at least on the interior. I wonder if they will do a more drastic change with the interior and make it look more like the Navigator with the tablet style infotainment screen? I like the E-Latch to synch the doors closed, but I don't favor the button actuated latches over a nice quiet door pull mechanism. I think Continental got a little carried away but it does give the car some character. MCEs typically don't make big changes to interiors anymore. We will probably see an update similar to the MKZ which preserved the design but added the new Lincoln Switchgear and beefed up the trim. Last edited by Assimilator; 06-30-2017 at 10:00 AM. I think the 3.0 is a given. E-latch, I'd say is likely going forward.....certainly on sedans at least. Crossovers may sit too high for them to be practical (that's part of why Navigator didn't get them).....at least the beltline version. I don't think we'd see a drastic change for the interior either, as they're likely limited with existing hard points. Those two changes would be for a redesign. Taking a closer look I think this prototype has the big door handles only for redundancy while they test the e-latch. Seems like the camo is trying to hide something I've circled below. Last edited by gjrip; 07-01-2017 at 12:36 PM. From the rear quarter angle, that area looks flat. The e-latch door handle protrudes as seen in the inset photo. 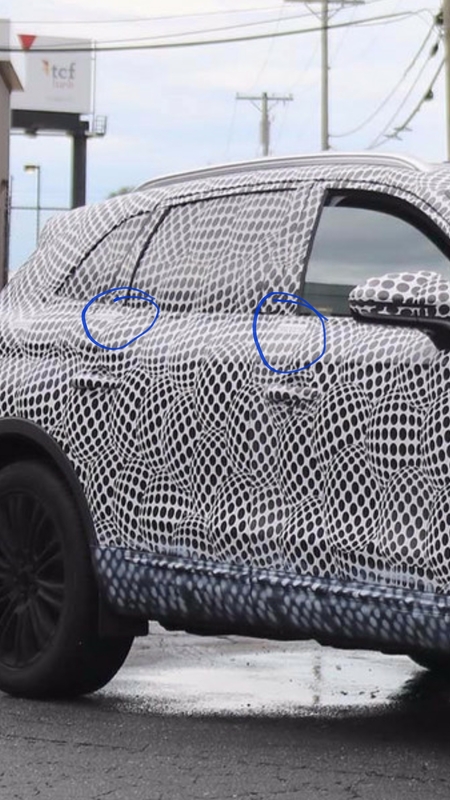 If you look at the old 2017 Continental spy photos, the camo couldn't hide the e-latch door handles completely because they stuck out. Last edited by AM222; 07-01-2017 at 05:30 PM. Such a change wouldn't happen for a refresh, it would involve redesigning the entire door - not just the sheetmetal. @AM222 I'm not suggesting it is a similar system to the Continental. Something similar to Tesla or even an older Vette, using the sane touch pads used on the Continental no doubt. @rmc523 we don't know that such considerations weren't made when this vehicle was designed, which wasn't that long ago. Wouldnt be surprised if they just wanted to debut fancy doors on the Continental. I don't know though. Just saying there is a notable anomaly in the camo exactly where an e-latch type device would be. Wouldnt be surprised if they just wanted to debut fancy doors on the Continental. Or simply ran out of time - and the gadget XYZ was simply deemed not worth a delayed launch ... Which happens more often that us in product like to admit. They look great on the Velar. If e-latches were going added to the MKX they would have to do it with the existing door stampings, they never change these out since it's far too expensive for an MCE budget and I'm sure it's not that important to them. Last edited by Assimilator; 07-03-2017 at 10:37 AM.